On Sunday 21st we competed for the 3rd and final time this year… This time “The Big One” – The TYMBA Nationals, held at Cannock Leisure Centre. Things didn’t get of to the best of starts with Kate’s bad back and Alex Bright feeling very unwell, the first few rehearsals were poor, but as the morning progressed the band started pulling together and by the time it was due to compete, they were looking and sounding good. Overall, the scores received were good enough to have won most of the categories, but due to a technicality / misinterpretation of the rules*, the band were disqualified. 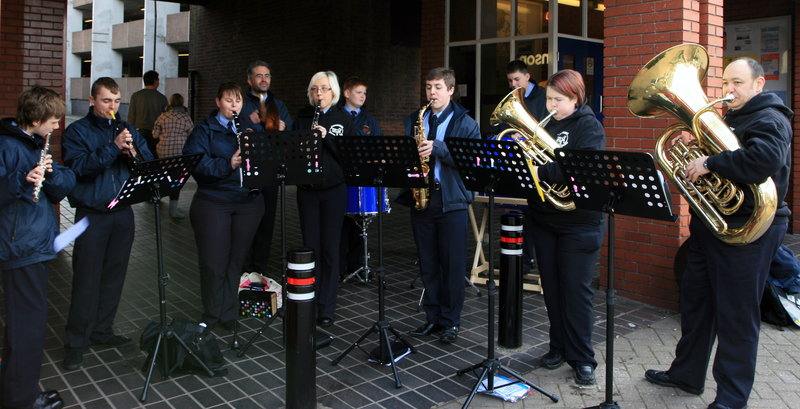 This was further compounded when it was found that the same rules had been broken at the earlier contest at Rubery, and the band were stripped of that win too. The Manchester result stood as there was no infringement at that contest. End result: Asthma attacks, Vomiting, Serious back pain and lots of tears. *The rule in question relates to the number of ‘Over Age’ competitors and the date at which they are deemed to be over Age.